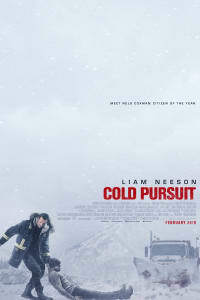 On February 8, Liam Neeson leads us into COLD PURSUIT, a chilly and bitterly funny revenge movie. Neeson plays Nels Coxman, a kindly small-town guy whose son is murdered by slimy crime lord Viking (Tom Bateman). With just a bit of info about the people responsible, Nels goes on a journey of revenge. Very violent revenge. 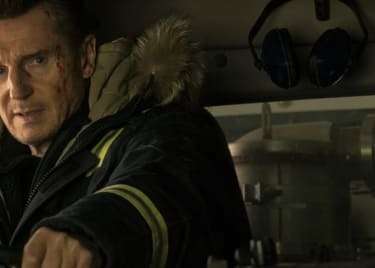 This character, however, is a bit different from Neeson’s now-trademark man with “a very particular set of skills.” He’s just a snowplow driver whose main understanding of violence comes from reading crime novels. His revenge sets off a full-blown gang war between Viking and the Native American gangster White Bull (Tom Jackson). Chaos and calamity ensue. This story of snowplowing, vengeance and woe features a superb cast. Let’s meet them! He’s one of the planet’s best dramatic actors and one of our favorite action stars. Neeson’s turn as Coxman gives him a chance to send up his manly, stoic warrior dude persona while finding some pathos. And he’s funny! Do not overlook that COLD PURSUIT has some big laughs amidst all the killing. This beloved and wildly talented performer has done everything. She’s turned one of the most famous unseen characters in television (Diane of “Twin Peaks”) into a brilliant, compelling character. She helped audiences believe in JURASSIC PARK’s dinosaurs. She’s a high-ranking officer in STAR WARS: THE LAST JEDI and an award-winning cornerstone of the cast of HBO’s “Big Little Lies.” In COLD PURSUIT, she plays Grace, who is married to Nels, and responds to grief very differently from her husband. Emmy Rossum is both a musician and an actor. She broke out in 2004 with turns in both THE PHANTOM OF THE OPERA and THE DAY AFTER TOMORROW. Since then, she’s gone on to star in the long-running TV series “Shameless,” alongside William H. Macy. In COLD PURSUIT, she plays a detective who is trying to get to the bottom of all of the carnage — and who is maybe a little bit too excited about the opportunity. This longtime character actor has appeared everywhere from HALLOWEEN to RAISING ARIZONA to “Justified.” Forsythe plays Wingman, Nels’ semi-estranged brother and his guide to the Colorado criminal underworld. Bateman is a repeat collaborator of Kenneth Branagh; he appeared in MURDER ON THE ORIENT EXPRESS and is set to feature in its sequel. Outside his work with Branagh, Bateman starred in the ITV/Amazon television adaptation of “Vanity Fair.” For COLD PURSUIT, Bateman dials up the smarm to play Coxman’s nemesis: the loathsome, murderous crime lord Viking. A Canadian actor with Cree heritage, Jackson has worked in television for years. In the U.S., he may be best recognized from a long run on the children’s program “Shining Time Station,” alongside an ensemble cast that included George Carlin. In COLD PURSUIT, he plays White Bull, a Native American crime lord and rival of Viking. Jackson’s character is far more honorable than Viking, but no less dangerous. Julia Jones has had notable television roles on shows like “Westworld,” “ER” and “Longmire,” and she played part of the werewolf clan in three TWILIGHT movies. More recently, she added emotional weight to WIND RIVER. 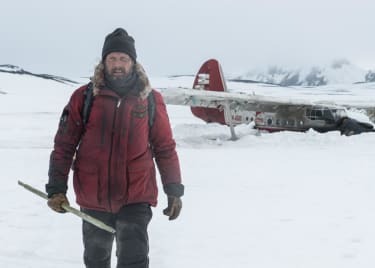 In COLD PURSUIT, Jones plays Aya, who once had the misfortune to be married to Viking. She got out of the marriage, but remains in the gangster’s life because they share custody of a preteen son. She’s no pushover and has precisely zero qualms about standing up to her ex. See this cast in action when COLD PURSUIT hits AMC® on February 8!